On this Friday before Independence Day, this bit of cartoon patriotism seemed appropriate. From the Internet Archive, here is Bunker Hill Bunny. Only Axis Attack On Continental U.S. The National World War II Museum posted this items about the only Axis attack on the continental U.S. during WWII. The notion of a submarine carrying an airplane seems a little like science fiction, even today. I believe I have seen the idea in some comic books of the era, but the Japanese deployed such a vessel. The aircraft from I-25 dropped incendiary bombs on the northwest U.S. after the above encounter, but rains and the U.S. Forest Service prevented any noticeable damage. Today's Sunrise Serenade was "Are You All Reet" by Cab Calloway and His Orchestra. Click on the song title to listen courtesy of Jazz On Line. This morning's Sunrise Serenade was "Pecos Bill" by Roy Rogers and the Sons of the Pioneers. Click on the song title to listen courtesy of Jazz On Line. Today's Sunrise Serenade was "After You've Gone" by the Benny Goodman Sextet. Click on the song title to listen courtesy of Jazz On Line. This morning's Sunrise Serenade was "Johnny Fedora And Alice Bluebonnet" by the Andrews Sisters. Enjoy the video from YouTube. The playlist for the June 21, 2017 broadcast of the Swing Shift Shuffle has now been added to the playlist filing cabinet. This morning's Sunrise Serenade was "MacPherson Is Rehearsin'" by Chick Webb and His Orchestra with Ella Fitzgerald. Click on the song title to listen courtesy of Jazz On Line. The Red Hot Lindy Hop lessons and sessions continue at the Rumba Room this Friday night. Free beginner lesson at 7:00 p.m. Free admission before 7:00 p.m. and $5 thereafter. Lesson by Jaredan and Joy with music by DJ Jaredan. Today's Sunrise Serenade was "Peanut Vendor" by Stan Kenton and His Orchestra. Click on the song title to listen courtesy of Jazz On Line. This morning's Sunrise Serenade was "Juneteenth Jamboree" by Louis Jordan and His Tympani Five. Click on the song title to listen courtesy of Jazz On Line. Today's Sunrise Serenade was "Trombonology" by Tommy Dorsey. Enjoy the video from YouTube. The playlist for the June 14, 2017 broadcast of the Swing Shift Shuffle has now been added to the playlist filing cabinet. The Red Hot Lindy Hop lessons and sessions continue at the Rumba Room this Friday night. Free beginner lesson at 7:00 p.m. Free admission before 7:00 p.m. and $5 thereafter. Lesson by Jason and Monica with music by DJ Monica. Today's Sunrise Serenade was "Chicken Reel" by Jimmy Dorsey and His Orchestra. Click on the song title to listen courtesy of Jazz On Line. Electrolux Corporation, M&W Friendly Shoes, Jack Frost hobbies and crafts, the Bomah Barber Shop, the Playhouse Toy Shop, The Wee Mart, Quaker Drug Company, Charles Owens Jewelers, the Kiddie Corner, Pola’s Maternity Shoppe, Brewster’s Card Shop, and Dino’s Restaurant. This 1940 animated short from Max Fleischer features a group of ants defending their home from an anteater. I had never seen this cartoon before, and it has some clever bug-based gags. From YouTube, here is Ants In The Plants. As the Pappy's Golden Age Comics Blogzine points out, the flying saucer craze started about 70 years ago in 1947 with sightings of UFO's by a pilot in Washington state. 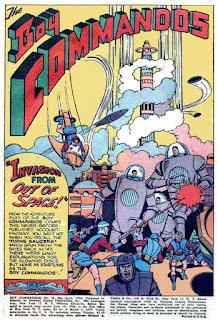 This 1948 issue of Boy Commandos cashed in on that story with no holds barred, including Martians, giant robots and a tiny atomic bomb. Today's Sunrise Serenade was "Petootie Pie" by Ella Fitzgerald and Louis Jordan. Click on the song title to listen courtesy of Jazz On Line. The playlist for the June 7, 2017 broadcast of the Swing Shift Shuffle has now been added to the playlist filing cabinet. 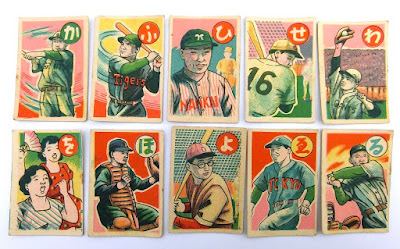 Just saw this photo, posted on Dull Tool Dim Bulb, of a set of 1949 Japanese baseball cards. Not much information in the post, and I certainly cannot read Japanese, but some interesting observations are possible. The first and most obvious item: the cards are not photographs, but artistic renderings of the players, almost in a comic book style. I cannot be certain if these were meant to represent specific, individual players, or just generic players for the team indicated. The fact that the team names are in English (Giants, Tigers, Tokyo) is also interesting. The Red Hot Lindy Hop lessons and sessions continue at the Rumba Room this Friday night. Free beginner lesson at 7:00 p.m. Free admission before 7:00 p.m. and $5 thereafter. Lesson by Todd and Erin with music by DJ Todd. Today's Sunrise Serenade was "Royal Garden Blues" by Benny Goodman. Click on the song title to listen courtesy of Jazz On Line. I do not remember how I discovered the writings of Richard Halliburton, but I have read several of his books, and enjoyed them. Bear in mind, there is little food for deep thought therein. They are light-hearted, and at some points exaggerated, descriptions of world travels by a colorful and head-strong young man. I can see why they became popular in their time (1920s-1930s), if not critically acclaimed. Today, they offer a very interesting glimpse into the past, providing the additional escape of history into what was already escapist literature of its time. Memphis Magazine posted this article about Memphis' home-grown adventurer. This morning's Sunrise Serenade was "My Dreams Are Getting Better All The Time" by Vera Lynn. Enjoy the video from YouTube. If you are a fan of Golden Age Hollywood, this Warner Bros. animated short from 1941 has everything you want. WB parodied pretty much all of its big name stars in this short. Posted on YouTube, here is Hollywood Steps Out. This morning's Sunrise Serenade was "Call The Police" Jimmie Lunceford and His Orchestra. Click on the song title to listen courtesy of Jazz On Line. 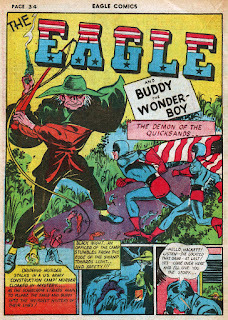 I don't remember every posting an Eagle comic before. 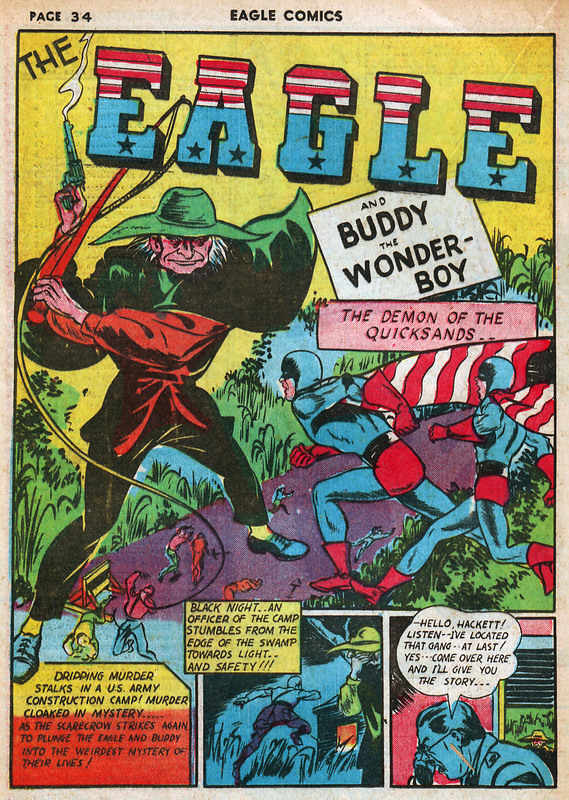 In this issue, the Eagle and his companion, Buddy the Wonder Boy, encounter a whip-wielding villain apparently known as the Scarecrow. Posted on Four Color Shadows.